Two Knights Defence 4.d3 4.Nc3 - Chess Gambits- Harking back to the 19th century! White's most aggressive tries against the Two Knights Defence are 4.Ng5 and 4.d4 (the latter transposes to the Scotch Gambit after 4...exd4) but in practice White sometimes prefers a quieter approach, simply defending the e4-pawn from attack. The most important is 4.d3, but White can also try 4.Nc3, or leave the pawn hanging with 4.0-0. 4.Nc3 should be met by the "fork trick" 4...Nxe4, intending 5.Nxe4 d5, attacking the bishop on c4 and the knight on e4. I used to have the impression that this gave Black the advantage, reinforced by White's tendency to respond sub-optimally in my own games with it, but in fact the position is merely equal if White plays 6.Bd3, intending 6...dxe4 7.Bxe4, whereupon 7...Ne7 (intending ...f7-f5 hitting out at the bishop) may be more reliable than the standard "book move" 7...Bd6. Instead White can transpose into a line of the Boden-Kieseritzky Gambit by playing 5.0-0, inviting Black to play 5...Nxc3 6.dxc3 f6 and play to hold onto the extra pawn. White gets some hacking chances on the kingside (the most challenging plan probably being a quick Nf3-h4, threatening Qh5+, followed by pushing the f-pawn) and Black has to be careful, but it should not really provide enough compensation for the pawn. 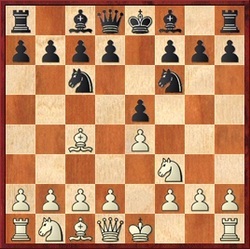 A safer option is 6...Be7, returning the pawn, although many games with this line tend to end in draws. 4.0-0 will usually come to the same thing after 4...Nxe4 5.Nc3, as White doesn't have any particularly good alternatives (e.g. not 5.Re1 d5). Two Knights Defence players should check out the notes to Game 3 (Fabri-Ashton, Blackpool 2014). This line is often neglected in coverage of the Two Knights Defence because the wilder lines stemming from 4.Ng5 and 4.d4 are more fun to analyse, but in practice many White players at all levels prefer the quiet 4.d3, defending the pawn on e4. White can develop in "Giuoco Pianissimo" style or try to steer the game into channels similar to the Closed variation of the Ruy Lopez (1.e4 e5 2.Nf3 Nc6 3.Bb5 a6 4.Ba4 Nf6 5.0-0 Be7 etc.) Since this approach from White is not really in keeping with the spirit of this site (Dr. Dave Regis at Exeter Chess Club calls this type of approach the "Old Stodge") I have focused mainly on active responses from Black's point of view, rather than giving an encyclopaedic coverage. The most obvious way to force an active game is 4...d5, but unfortunately for Black it is rather dubious because after 5.exd5 Nxd5 6.0-0, the e5-pawn becomes too weak. Black can sacrifice it and generate complications with 6...Bc5 7.Re1 0-0 8.Nxe5 Qh4, which might work at rapid time controls, but after 9.Qf3 and even 9.Nf3! ?, inviting Black to take on f2, White can get quite a large advantage. If Black wishes to play ...d7-d5, then a more reliable method of doing so is to strive for rapid kingside castling, getting the king off the e-file, and then play ...d7-d5. Black can play 4...Bc5 transposing to the Giuoco Piano, with the aim of 5.0-0 0-0 6.c3 d5, which gives active play, though I think White can get a slight edge, and 6...d5 doesn't work very well if White tries 6.Nbd2 instead. An alternative is 5.Nc3, against which Black cannot get in ...d7-d5, and after 5...d6 White can consider 6.Bg5, the Canal Variation, with the idea that White is doing quite well after 6...h6 7.Bxf6 Qxf6 8.Nd5 Qd8 9.c3 intending d3-d4, but 6...Na5 is an effective response for Black. Black appears to get more scope for active play with the apparently-restrained 4...Be7, as recommended by John Emms in Play the Open Games as Black. Again, the main idea is to get in ...d7-d5, which often works better with the bishop placed on e7 rather than on c5, such as after 5.0-0 0-0 6.c3 d5, which appears to equalise fully here. 6...d5 is also playable against 6.Nbd2 and 6.Bb3, though is less likely to give full equality, and Black can offer a Ruy Lopez Marshall Gambit-style sacrifice of the e5-pawn in some lines, aiming to generate kingside play to compensate. Against 6.Re1, Black cannot get in ...d7-d5 without it involving an unsound sacrifice of the e5-pawn, but can get good play with an ambitious plan involving ...Kh8, ...Ng8 and ...f7-f5, which is often followed up by a ...Rf8xf3 exchange sacrifice, taking advantage of the fact that White's Rf1-e1 has reduced the defence of the f2-pawn. White can try 5.Nc3 instead, after which Black can consider a plan with ...d6 and ...Nf6-d7 followed by an eventual ...f7-f5. Another idea for Black is to delay kingside castling and push the kingside pawns forward towards White's king. I have given a few examples of this in the notes to the illustrative games. This works quite well if White plays passively, but be warned, it is dubious against many of White's more ambitious approaches, for Black's king can become vulnerable in the centre and if Black castles queenside then White can get a strong attack with a2-a4 and b2-b4-b5. 1. 4...Bc5 5.c3 (or 5.0-0) after which I mainly focus on plans with ...d7-d5. 3. 4...Be7 5.Nc3 (I also examine 5.c3, which allows Black to get in ...d7-d5 effectively, e.g. 5...0-0 6.0-0 d5). 5. 4...Be7 5.0-0 0-0 6.Bb3 (I think 6...d5 is Black's most reliable way of getting an active game here, though 6...d6 with the idea of steering play into Closed Ruy Lopez style channels may objectively be superior).